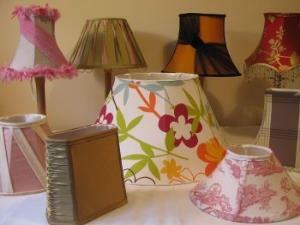 Jan Woodhouse01600 716827work ShopJan makes lampshades, cushions, bedding, blinds and curtains, which are tailored to her client’s requirements to complement their existing interior designs. Her bespoke lampshades add the perfect finishing touch to a home, whether existing frames are restored and re-covered or something completely new created. Jan enjoys working with clients to create stunning and imaginative pieces and she likes the idea of utilising fabric and frames that would otherwise be forgotten; she designed a bedside lampshade and used the silk from her client’s wedding gown, making a unique piece with a special provenance. Jan makes lampshades, cushions, bedding, blinds and curtains, which are tailored to her client’s requirements to complement their existing interior designs. Her bespoke lampshades add the perfect finishing touch to a home, whether existing frames are restored and re-covered or something completely new created. Jan finds inspiration from many sources - the natural beauty of her environment, many modern media, as well as contemporary and vintage fabric designs and enjoys creating beautiful yet practical accessories.